Approved and recommended by Quick Find Directories, Hayford Kitchens and Bedrooms specialises in fitted kitchen installations and kitchen supplies. Though they were established in 2003, they have combined experience of more than 30 years. They cater to customers who are looking to install a great looking kitchen for their property without spending too much. All the kitchen appliances that we offer are manufactured by some of the leading brands in the market. So quality is one thing you should never be worried about. A local trusted trader Solihull, Shirley, Castle Bromwich, Birmingham and surrounding areas. "Now that we have started to use and enjoy our new kitchen,Graham and i would like to express our appreciation for the superb level of care and attention Hayford Kitchens gave us, right from the design stages through to after sales service. The work undertaken by the istallation team was of the very highest standards and we will have no hesitation in recommending Hayford Kitchens to others, if we have the opportunity." "Many thanks from both of us for an excellent job. We are very pleased with the finished result,and send our special thanks to Bob (the best kitchen fitter in the west).He put up with all sorts of difficult comings and goings during breakfast preparation,with good humour and the occasional joke! Well done and thanks also to the granite gang. They were quick and effecient,just what we needed as we run a Bed & Breakfast Business. 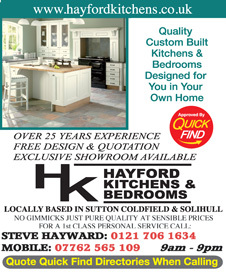 We wish Steve at Hayford Kitchens & his team well for the future. Celia & Steve"